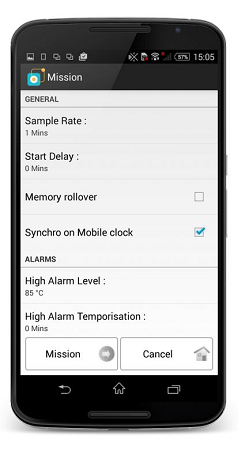 The Thermotrack Mobile Kit for Android provides all the necessary hardware for connecting an Android Tablet or Smartphone to Maxim Integrated's Thermochron and Hygrochron iButtons. This system is designed to operate both as a standalone Thermochron solution and as a component within the Thermotrack Online System (link). To accomplish this end, Thermotrack Mobile provides the ability to configure new mission settings, relaunch with the current settings, download logger data, and a exportation methods. The data is stored within the Smartphone/Tablet until an internet connection is established via cellular data service or WiFi. Upon the establishment of the data connection, the app will transmit the stored data to configured locations. Many Android devices are support by Thermotrack Mobile Edition. Tested models include the Galaxy Tab4 10.1, blah blah, and blah. Select "General" from the upper navigation bar. Select "About Smartphone" or "About device" (Tablet) from the "Device Manager" section. The "Android version" must be 4.0.0 or higher. Go to the Google Play™ Store. Select "USB OTG Checker" or similar app.